Le Café Anglais, an Anglo French restaurant, is situated on the second floor of Whiteleys Shopping Centre in Bayswater, a location that I’ve always thought a little peculiar for an eatery pitched at the higher end of the dining scale. For the ‘geographically disorientated’ like me, I traipsed my way, floor by floor, through the shopping centre to get to the restaurant. But readers who want to go should take heart, for there is a lift that takes you directly to the restaurant from Porchester Gardens, and which I only discovered as I was leaving (doh!). The restaurant is an enormous 7,000 square feet, but it isn’t so much the floor space as the height space that is impressive. It’s tall, tall, tall, and there are gorgeous art deco windows that run along the height of the walls and which are dressed in lush red curtains. There is an open kitchen situated towards one end of the room, and there are elements of glamour to the restaurant, but I must confess to thinking that the patterned maroon carpet didn’t quite work with the rest of the décor. It all looks expensively done, but there is a sense of sterility to it, and it’s probably better suited for bistro-type lunches than intimate dinners. The menu is a smorgasbord of variety. It comes in the shape of A3 sized sheet, and on it there are approximately nine types of hors d’oeuvre (£3.50 to £4.50), followed by some 20 first course choices (£6.50 to £13.50). And this is before you even get to the fish, meat or vegetarian courses (£11 to £29.50), with all their variations, eg, plain or with sauce; whole chicken, half chicken, leg of chicken, etc. There is also a daily evening roast special. 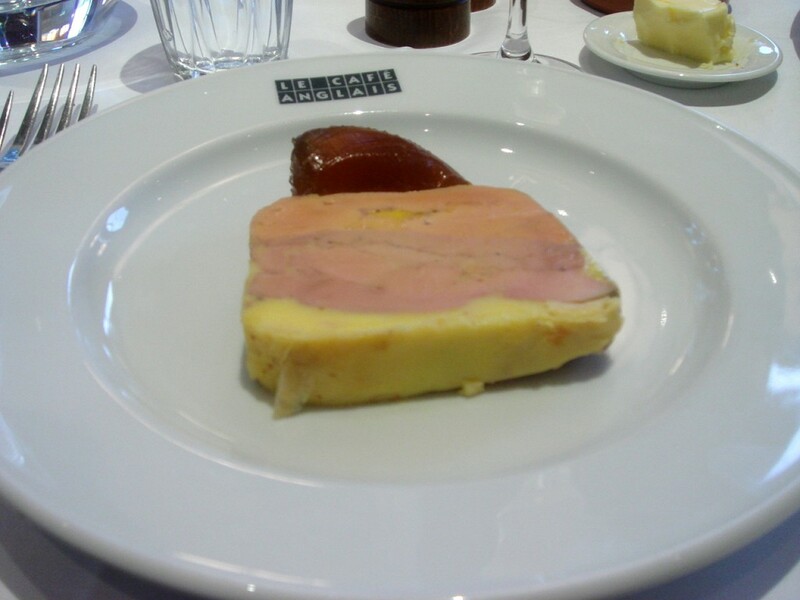 We started with a foie gras terrine with PX (Pedro Ximénez) jelly (£13.50). The terrine was creamy with a lovely texture. It had a rich flavour of foie gras, but the PX jelly was peculiar. It was bland and savoury, and as an accompaniment did little to accentuate the terrine. I would have thought something a little sweeter and more acidic would have worked better to cut the richness of the foie gras, which on its own was lovely. 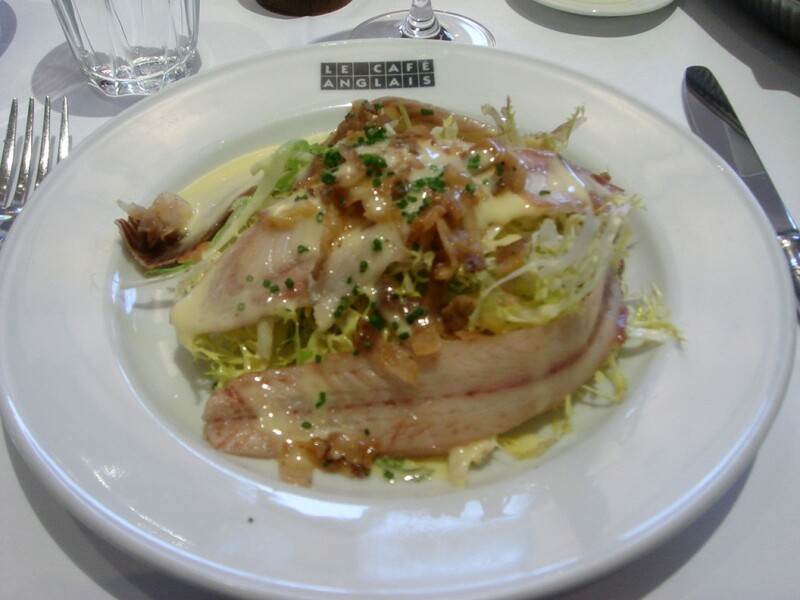 Next was a warm salad of smoked eel and bacon (£12.50). The eel was sweet and fresh, light on the palate, and gently smoked. The bacon added a nice bite to the dish but it was inconsistently dispersed such that with certain bites you got more bacon (and consequently a saltier mouthful) than at other times. Underlying the eel was a curly, slightly bitter, endive salad which was crispy, and which had been nicely dressed. To mains, and a Gloucester old spot pork (£15.00) was cooked well, yielding a tender, flavoursome and moist piece of pork. 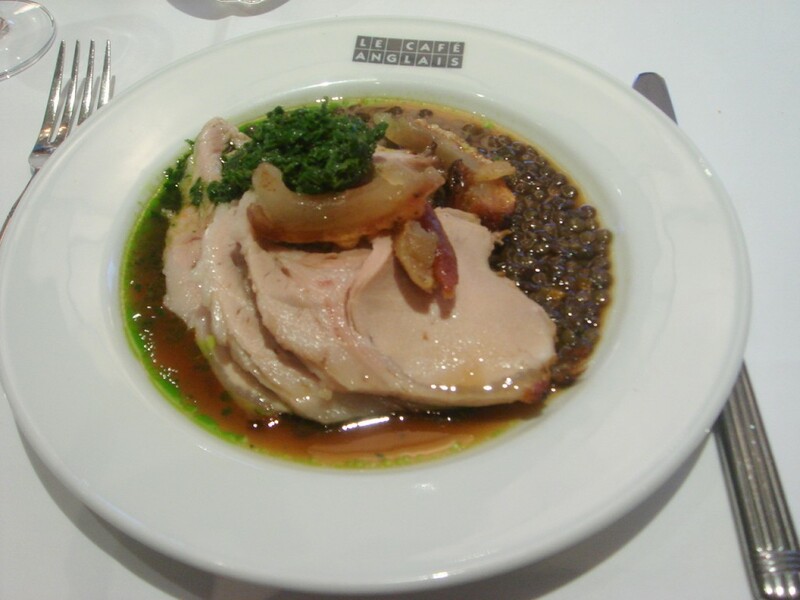 It was accompanied by lentils with salsa verde and a mint sauce, the flavours of which worked well with the pork. But the lentils were a little crunchy as they were slightly undercooked, the serving temperature of the dish was a little cooler than it should have been, and the pork crackling which came with the dish was disappointing. It didn’t crackle. Instead, it was chewy and it stuck to the roof of your mouth when you tried to eat it, rendering it unpalatable. Next was a guinea fowl with girolles, tomato and tarragon (£18.50). 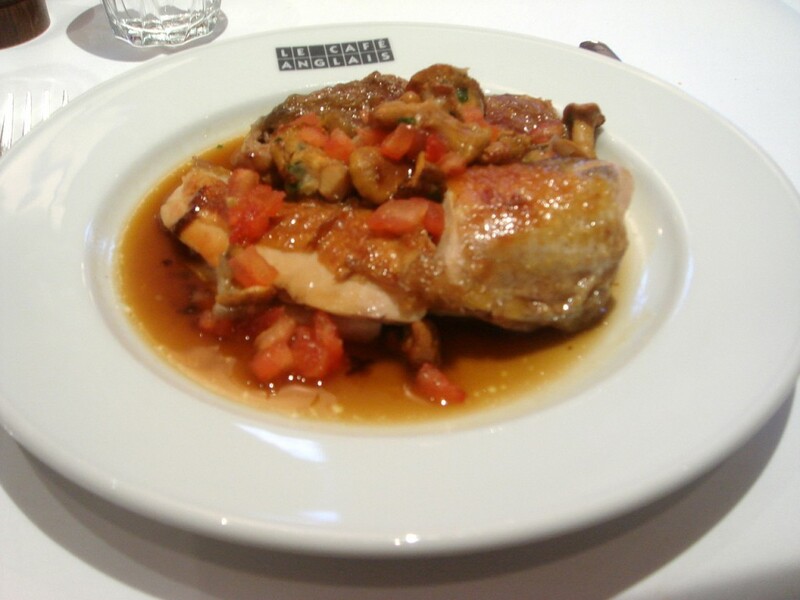 The guinea fowl was cooked well with a pleasant, robust flavour. But the girolles were also a little underdone and could have done with more sweating for something a little softer. Otherwise, the dish was very pleasant and tasty. 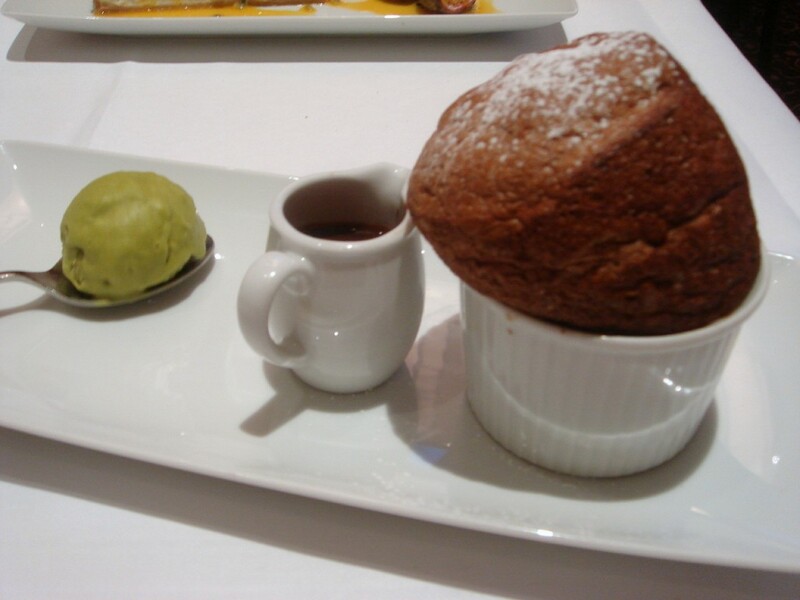 A chocolate soufflé (£8.00) came highly recommended by the waiter. It was almost double the height of the ramekin dish, and amusingly, came out lopsided. Either some of the mixture had stuck to one side of the dish because it had not greased properly, or a certain part of the oven was hotter than the rest, causing it to rise askew. I suspect it was the latter because it seemed that the lopsidedness afflicted the soufflés being served to other customers as well. And how did it taste? The outer layer of the soufflé was rubbery and was almost impenetrable with just my spoon. I was only able to break the surface with the use of both a utensil and my hand. It was served with a rich chocolate sauce which was divine, and a pistachio ice cream which was inedible. It might be a little difficult to tell from the picture, but there was a congealed outer crust on the ice cream, as if the ice cream had been placed on the spoon much earlier, and then left to sit in the freezer uncovered. The colouring was of an artificial green, and it tasted floury, as if the ice cream had been made from powder. 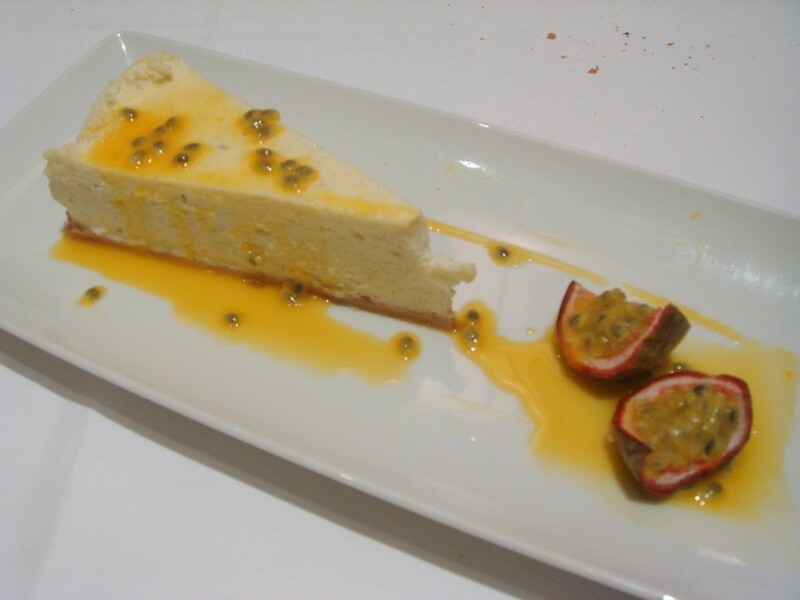 A vanilla cheesecake with passion fruit (£6.50) was better, but the base was soggy, rather than crunchy. And in what was must have been an oversight, there were visible smudge marks where the chef had not wiped the plate properly. Overall the service was acceptable. But it was better at the beginning of the meal for as the evening got busier it became increasingly more difficult to capture the staff’s attention. In what was an extremely nice gesture, we were provided with two free Kir Royales to kick off our meal. But I have to confess that I’m unclear whether this was because of a misunderstanding or not. We were initially booked on the Toptable menu of 3 courses with a Kir Royale for £24.50. In the end, we didn’t order food off this menu, and I’m not sure if the waiter had committed to giving us the Kir Royale before realising that we were instead going to order `a la carte. On the whole, the meal was an average for me, ranging from bad (soufflé) to average (cheesecake and pork) to a good for the rest. There were some lovely flavours coming through from the starters and the mains, and it was evident that the ingredients are fairly well sourced and fresh. But no one dish completely worked as there were mistakes in each. There was also some carelessness in the presentation of the cheesecake, and the soufflé was pretty bad. Readers should also be aware that Café Anglais charge a cover charge of £1.80 per person which I think is a little cheeky. And to put the pricing into context: we went to the Harwood Arms recently, where we paid £14 for an exquisite piece of pigeon that was superbly cooked. The pigeon here is priced at £22.50, which we didn’t order. But on the basis of what we ate this evening, I would find it hard to believe that it could be better that the one at the Harwood Arms. Café Anglais is pricey for the quality of the food served. Throw in the odd location, only ‘ok’ service, and I just can’t see myself ever going again. Price range – £24 to £52 for 3 courses. Excludes drinks and service. But you didn’t try the anchovy toasts and parmesan custard!! Excellent. Good review and I trust your judgement… so one place I can strike off the list of places to go before I start my slavery. Yes I read that you liked the anchovy toasts and parmesan custard. No, I didn’t try them but there’s probably not enough here to make me want to go back I’m afraid. G, Don’t think of it as slavery. Think of it as a good cause. You’ll be helping lots of people with your doctoring! I can’t believe you didn’t try the parmesan custard! The hor d’oeurves were my favourite. Shame you didn’t enjoy it, I had a great meal there. Hi Lizzie, Yes it sounds like I missed out. But even if I had the custard and enjoyed, I don’t think it would have changed my opinion of the food. You must be the first blogger to find such fault at L.C.A. I’m with Douglas – this is the first negative(ish) blogger’s review I’ve read of the place. So sorry you didn’t really enjoy it. I’ve still never been, but the Parmesan custard and anchovy toast are the signatures, and I’ll definitely have them when I do make it round. Hi Douglas and Ollie, Yes I know the general consensus is that this place is good. I am just writing a true reflection of what my experience was. I’m with everyone else on the parmesan custard! I had a similar pork dish when I went and didn’t think the crackling or lentils were as good as they should have been. We also had a service mix up too. The hors d’oeuvres were much better value than the starters and mains, it’s a shame they can’t be more consistent. Oh, that’s a shame! I’ve been there lots and always had a lovely meal. The parmesan custards are gorgeous but there are lots of other dishes that have pleased me too. I wouldn’t write it off yet. Hi Jenny and Niamh, yes it seems like I missed a trick by not trying the parmesan custard. It seems some people like Cafe Anglais. For me, this is an accurate reflection of my meal there. Yes it is overpriced. I think the food is average, especially considering what they charge. Regardless of what has been said about the parmesan custard, what I had when I went doesn’t inspire me to go back.